Fig. 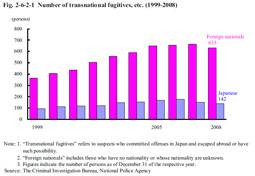 2-6-2-1 shows the number of Japanese and foreign nationals who committed offenses in Japan and escaped or possibly escaped abroad (hereinafter referred to as “transnational fugitives, etc.” in this subsection) over the last 10 years. Table 2-6-2-2 shows the number of transnational fugitives, etc. 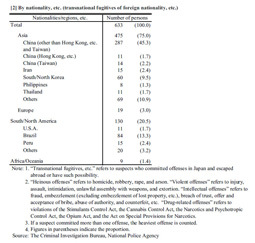 by Japanese/foreign nationals and by type of offense and the number of foreign transnational fugitives, etc. by nationality, etc. as of December 31, 2008. Examining transnational fugitives, etc. (including Japanese) by country and region to which they are assumed to have escaped as of December 31, 2008 revealed that China was the most common with 189 persons, followed by Brazil with 79 persons, the Philippines with 46, and the Republic of Korea with 45 persons (Source: The Criminal Investigation Bureau, National Police Agency).